Greetings from Fine Games. You are currently subscribed to Fine Games' Update Newsletter with the contact info below. If any of this information is not current or complete, please let us know immediately so that we can update our records. Main Ph# !*Tel*! Other Ph# !*Fax*! Cell Ph# !*Field3*! Trouble Reading this? View this page on our web site. This newsletter is sent periodically (very...) to those who have subscribed. Our Update Newsletter is designed to provide you with useful & timely info about the world of strategy board & card games. If you no longer wish to receive our newsletter, simply send us an email telling us so and perhaps a little bit about why; we'll remove you from our emailing list promptly. On the other hand, if you enjoy this newsletter, please forward it to a friend who may also be interested. Greetings. Been a while since our last newsletter, so we aim to make up for lost time. In the meantime, help us celebrate Fine Games 18th birthday. Please Check the Contact Info We Have On File For You; Email us if it isn't current. Fine Games celebrates its 18th birthday. A long, strange trip its been. .
A long, strange trip its been since we began doing business on 1 April 1992. So, this April Fool's Day, I look back with a mixture of disbelief & amazement that the hobby of my younger days has become the heart of my career. And wonder, what's next? Thru these 18 years, we've strived to provide good value in our games for your money, to maintain a pretty comprehensive library of games both new & used, and to maintain high ethical standards in how we do business. (Remember our primary customer service policy? No BS!) We've done a pretty good job of this over these 18 years, yes? We've fallen down in keeping up with internet technology; yes, we still don't have a shopping cart of thousands of pictures. And we've lost out by failing to address head-on wargame publishers' pre-order arrangements; these have eaten into our core business over time. Lastly, your experience with other dealers' special order practices have soured you on ordering games via special order (versus ordering off our shelves). Oh, and doing business in the 2010s can be a real pain. You'll read below in our 2010 Update about relentless increases in shipping costs, in credit card costs and hassles, in the prices of games, and the difficulty many wargame publishers have in getting their acts together. A long strange trip, indeed. Thanks for your business and support thru it all. This spring, we offer a special deal on shipping most boxed games anywhere within the US postal system (i.e. the territorial US plus APO/FPO addresses. And its FAST: priority mail typically arrives 2-3 days after shipment. Times have changed our customers' ordering habits, and many are ordering one game at a time instead of a small stack of games. This offer reduces the price of shipping for such orders (reduces it below our own postage cost, as a matter of fact). We intend this to make us more competitive for single-game shipments when compared with game publishers who typically subsidize their shipping charges. Details are these: (1) the destination must be accessable with the domestic USPS system, including APO/FPO addresses; (2) any ONE game that fits within a medium flat rate priority box qualifies; many boxed games fit, but many FB (flat boxed, such as classic AH games) & all LB (Large Boxed) games do not fit, and so do not qualify; (3) we will give you this special rate if you qualify; you needn't ask for it; (4) this offer may be withdrawn at any time. Some of our customers, especially the more dedicated collectors, will find a new catalog Fine Games offers to be very handy. If you're looking to make sure you've obtained all the games & mags you are interested in, this is a way to do it systematically. Plus, these lists aren't gummed up with games that are no longer available; items shown are either in-stock and/or still in-print. Our New Game Releases by Year & Month catalog allows you to view all the games actually published in a given month or year, all the way back to mid-1995 (when we started tracking this info). Want to see games published year-to-date in 2010? Done. Published in 2000? This is the place. In addition, you can always check out New Game Releases in the prior 2 months or prospective Pending Game Releases in the next 6 months. Another new Fine Games catalog, our New Game Price & Availability List (PDF), shows each of the 28,000-some items carried by our primary distributor in any of its 4 national warehouses. If you want to shop role playing games, miniatures, collectable card games, dice, and anything else we typically don't list in our own catalogs, you can do it with this catalog. Need more info or want to search online? You can do that as well our Alliance's Online Search web page. But wait, its get's better! Our customers' experience with special orders elsewhere have soured many; they just don't trust that the goods will arrive. We've addressed that concern by showing you in this catalog which items are available in the warehouse we most commonly shop from (2 days away in sunny California), and then also how many of the 3 more distant warehouses also have the item. With this availability info, you can easily judge how easily a given item can be obtained. Vae Victis is a French wargaming magazine akin to Strategy & Tactics with a game in each issue. Except that all the text is in French; English-translated rules are generally available for download. But the games are generally quite solid, and cover many aspects of European history overlooked by American publishers. They are a worthy addition to a wargame collection. We must import this magazine from Europe since no distributor carries it, a time-consuming & rather spendy proposition. But this is your opportunity to special order any available issues of Vae Victis. Given sufficient demand, we will place an order for these later in April which should arrive in June (yeah, June). Interested, see our listings for Vae Victis magazine games online, or give us a call. Most issues available. Please contact us by Monday, 19 April, if interested. Our observations of the state & trajectory of the board gaming hobby have been popular in past years' newsletters. (Review our past observations from March '08, Feb. '07, Aug. '03, Feb. '03, May '02, Sept. '99.) Let us share with you a bit of what its like to work within the board game industry — working with wargame companies in particular — in the recent times. Disintermediation: We have noted this result of the maturation of the internet for all of the last decade. Initially, it helped us connect with publishers & gamers (i.e. consumers). That lessened the need for distributors. Then publishers learned to both market to their gamers (a novel concept, eh?) and next to sell to them directly (which they'd resisted previously). Then they developed a pre-order system to gauge demand for their games and incentivize ordering direct. And that lessened demand for online retailers (such as yours truly). This has hit home. Distributors have all but given up on most wargame publishers. There are exceptions (GMT being the biggest), but try finding games from Australian Design Group (World in Flames), Multi Man (ASL), or GRD (Europa series games) sourced thru a distributor. Even if they were available, it would be at a very disadvantageous cost; Multi Man, for instance, sells to retailers at the same price it does to distributors, effectively cutting out the distributor level entirely. Here at Fine Games, sales of games from publishers using pre-order systems have declined sharply. Sometimes our price isn't competitive, but more often the pre-order is taken as a "vote" for a game — even tho we also submit pre-orders (and "votes") ourselves. This is a core problem Fine Games must address. Intermediation: That internet, it's a beautiful thing. It puts gamers in touch with one another, and our tiny community of a few tens of thousands scattered around the globe can connect with ease. In particular, comparing impressions about games can dramatically influence the success or failure of games. Even small publisher games can gain attention quickly if they put out a good product. And dogs? Well, god help you if you publish crap like WWW did in the early 90s because word will spread and you'll be carrying your inventory for a long, long time. In this respect, the internet is a very good thing as it helps the market do its work to reward good and ignore the bad. Fire & Movement Ceases Publication: F&M mag, long the premier wargame review magazine, ceased publication with its last issue (#150) in January. The only remaining print mag is now Paper Wars, which seems to have rather limited distribution tho its of largely the same quality as F&M. F&M's publisher cited declining numbers, authors' lack of timeliness, as well as simple obsolescence of the print magazine format in the age of the internet. See Disintermediation, above! Read DG's plan to create a more timely, online version of what was Fire & Movement. Going up, Up, UP! Game Prices & Weights: Both the prices and bulk of games are been rising sharply in recent years. Games that were once maxed out at $40 now easily reach $60 or more. Kits can be $40. Its a crude measure, but among the games we deal in the average price increased 6.1% in 2009 versus 2008, and 27% over 2000. This is insignificant for many with sizable disposable incomes. But for younger gamers with more limited income, and arguably greater alternatives for their limited resources, it is another thing that weakens the gaming industry's future. Fees, Everwhere Fees: Times are tough all around. And many of our vendors spread the joy. UPS & USPS have been increasing their shipping charges well above inflation for years; the postal service says its losing money despite that. UPS creatively extends its fees each year, adding one for those more rural than others (11% of our customers are "rural" per UPS), doubling its weekly account fee, and increased its fee to make even minor address corrections ($10). PayPal changed policy last year so that all "non-personal" payments are assessed a fee of roughly 3%. For that reason, payments must be declared as "personal" to avoid fees to the recipient even when drawn from funds already in your PP account. But the winners are credit card companies. Visa, MasterCard, Discover, AmEx & others have piled fee upon fee for the privaledge of processing a credit card charge. Today, there are about 8 V/MC/D fees for each payment processes where two years ago there were basically none. And before we switched processors early this year, we were paying up to 5.5% on each transaction. Things are better, but each month there is a new fee for some fictional service. Those Within the Game Business: We can be pretty funny ourselves! Take, for instance, a small publisher of very large wargames. Our key contact there can't figure out how to set up his voice mail. Hasn't for three years. Or a major publisher of tactical scenario kits & games is busy. Really busy. Really really busy. So busy that it took them 2-1/2 months to ship our last order to us. And they have some problem getting all the parts that belong into their bigger games into the games before they ship. One of our long-time competitors, tho never a rival, Jim Sandefur, announced that he will be retiring and thus that his game company, Boulder Games, will likely close in the immediate future. He is currently liquidating his inventory so check out his sale, and tell 'em we sent you. 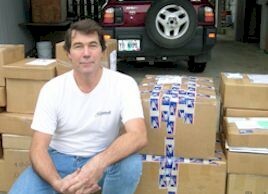 Jim dates his business to 1989, the same year that we began buying & sell games informally. We were just behind him in formalizing our business in establising relationships with distributors (something that was not easy to do as a mail order retailer in the early 1990s). So we see a bit of ourselves in his decision to move onto other pursuits which offer greater fulfillment in the second half of his life. And we certainly wish him & his pot (whoops, pots) well! Reading this puppy is admittedly a chore as it is over 160pgs long. There are, after all, over 5,000 discreet items in our inventory. But like a good candy store, there oh so many treats hidden in the nooks & crannies. And we'll bet you that if you look at any random page in this catalog, you'll find something that interesting to you, maybe a whole string of items. Fine Games provides many services to you at the cost of merely keeping informed of your current contact info. We encourage you to take advantage of these as they suit your needs at the time. Did We Mention Fine Games' Update Newsletter? Help us create the perfect game sale. Tell us what's important to you. Low price, discounted or free shipping, expedited shipping? What would inspire you to buy more games from Fine Games? Tell us what you think. Tell us as well what you liked or didn't like about this newsletter. How can we make it more interesting & valuable to you? Lastly, our Liquidation Catalog offers you pile of deeply discounted games needing a good home. These are a hodge podge of games, magazines, accessories, PC game software, and surplus computer equipment. All are available for immediate sale at liquidation prices. Currently, this catalog shows about 259 items. We continue to add items as well as to systematically reduce the price of items that remain periodically until most of this stuff is gone. © 2014, Fine Games for Players & Collectors. All rights reserved, thank you very much!